Europeans are buying cars that are more efficient. Average carbon dioxide emissions per kilometre continue to fall in Europe, according to preliminary figures released today. The 2011 data from the European Environment Agency (EEA) also show that car manufacturers are mostly on track to meeting European Union (EU) targets. We can see new cars becoming more efficient year-on-year – a good example of regulation helping industry to make real improvements. It is also encouraging to see sales of electric cars starting to climb. There were 12.8 million new vehicles registered in the EU in 2011. The average CO2 emissions for these cars was 135.7 grams CO2 per kilometre, which is 4.6g CO2/km less than in 2010 – a reduction of 3.3 %. A combination of changes in buying behaviour, improved technology and engine efficiency was mostly responsible for this reduction, according to EEA analysis. In addition, the long-term reduction of emissions has been influenced by an increasing uptake of diesel cars, an ongoing trend which continued in 2011. The gap between average CO2 emissions of new diesel and petrol vehicles has been narrowing in recent years – in 2011 it was just 3.2g CO2/km. In 2011, 55.2 % of the vehicles registered in 2011 in Europe were diesel vehicles, an increase from 51.3% in 2010. In the EU, CO2 emissions from road transport have increased by 23 % between 1990 and 2010, becoming responsible for approximately one fifth of the EU's total emissions. In order to cut greenhouse gas emissions from transport, carmakers have a collective target for the average car sold in the EU to emit a maximum of 130g CO2/km by 2015 and 95g CO2/km by 2020. Last year the EEA reported that manufacturers had some distance to go to meet the 2015 target. However, on present trends, the industry as a whole is on track to meeting the 2015 CO2 target. The preliminary figures will now be verified by car manufacturers before they are confirmed by the European Commission later this year. Registration of new cars in the EU increased constantly between 2001 and 2007, peaking at 15.5 million cars, but has fallen continuously since. Between 2010 and 2011 the number of new car registrations increased in many Member States, notably Latvia (71%), Lithuania (68%) and Estonia (66%) , but fell in others, including Greece (-31 %), Portugal (-31%) and Spain (-17 %). The mass of new cars increased slightly in 2011 and is now back to the level seen in 2007 before the economic crisis. Nonetheless, engine capacity, measured in cm3, has decreased by 5 % compared to 2007. Registrations of vehicles using liquefied petroleum gas fell by 76% between 2010 and 2011. This was mostly due to a sharp decline in uptake in France and Italy, countries where this fuel is most commonly used. There were 8,700 pure electric cars registered in 2011. While this number is only 0.07 % of new cars registered, so did not significantly influence the EU average emissions, it is a 10-fold increase on 2010. Portugal, Malta and Denmark had registered the most carbon-efficient cars on average, with emissions of 125g CO2/km or less. At the less efficient end of the spectrum, new cars registered in Estonia, Latvia and Bulgaria had more than 150g CO2/km on average. For the second year, EEA has collected Member States’ data on passenger cars registrations, in accordance with the Regulation 443/2009, and collated them in a database which covers all passenger vehicles registered in Europe in 2011. Data collected includes information on CO2 emissions and mass of the vehicles, reported by all Member States in order to evaluate the performance of the new vehicle fleet towards the CO2 emission target (130g CO2/km by 2015). According to Article 8 of the Regulation 443/2009, Member States must submit information to the European Commission for each new passenger car registered on their territory. There were some late submissions this year, although the EEA has noted improvements in the data submitted for some Member States. Car and van makers continue to meet CO2 emission targets ahead of schedule Almost all car and van manufacturers have met European carbon dioxide emission limits several years ahead of their deadlines, according to updated information from the European Environment Agency (EEA). Monitoring CO2 emissions from new passenger cars in the EU: summary of data for 2011 For the second year, the EEA has collected Member States' data on passenger car registrations, in accordance with Regulation (EC) No 443/2009 (CO2 from cars). All Member States reported information on CO2 emissions and the mass of cars, together with other vehicle characteristics. 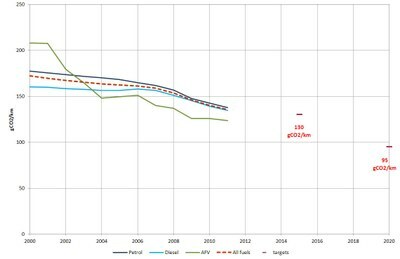 This data was used to evaluate the performance in 2011 of the new vehicle fleet, and its progress toward meeting the CO2 emissions target of 130 gCO2/km by 2015. For references, please go to https://www.eea.europa.eu/highlights/new-cars-sold-in-2011 or scan the QR code.